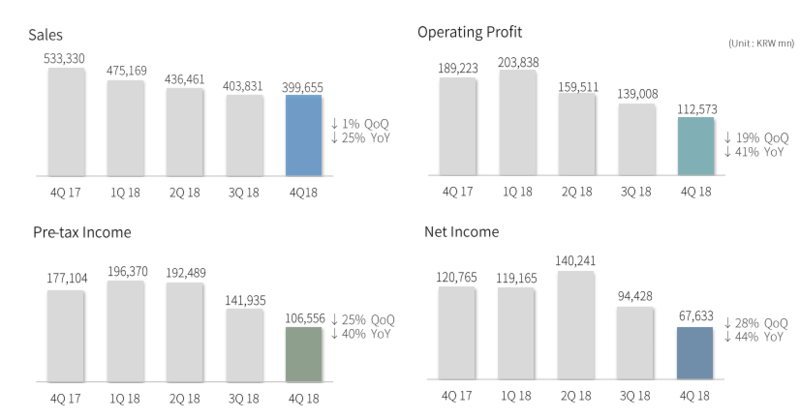 NCsoft Corp (036570 KS)‘s 4Q18 earnings fell short of the consensus earnings estimates. In 4Q18, NCsoft reported sales of 399.7 billion won (down 25.1% YoY and 1.1% lower than consensus), operating profit of 112.6 billion won (down 40.5% YoY and 13.3% lower than the consensus), and net profit of 67.6 billion won (down 44% YoY and 32.9% lower than the consensus). Three different analysts raised questions about why the company changed the timing of the launch of the Lineage2M game. In the 3Q18 earnings conference call, the company previously mentioned that it will most likely launch the Lineage2M mobile MMORPG game in 2Q19. In the most recent 4Q18 earnings conference call, the company mentioned that it will launch Lineage2M by the end of 2019. We expect little change to the consensus earnings estimates of NCsoft in 2019 and 2020. Although Tencent consortium acquiring Nexon could pose greater competitive threats to NCsoft in Korea, it could also lead to a consolidation of the gaming sector in Asia, which would be a positive for the company. NCsoft is currently trading at P/E multiples of 15x in 2019 and 12x in 2020, based on the consensus earnings estimates, which are attractive. We maintain our positive view of the company following its 4Q18 earnings.